Meet Layalina Kasyanenkova. She's a bright young Agent of the New Order. She believes in the Code and fair play. Not everyone appreciates fair play. Despite having 20 minutes to display a permit or vacate the asteroid belts, Adrianne Cortanna got herself ganked. So much for the "if only they warned us, then we'd pay" crowd. Judging by the ship she lost, nothing could've persuaded Adrianne to buy a permit. Look at that atrocity. 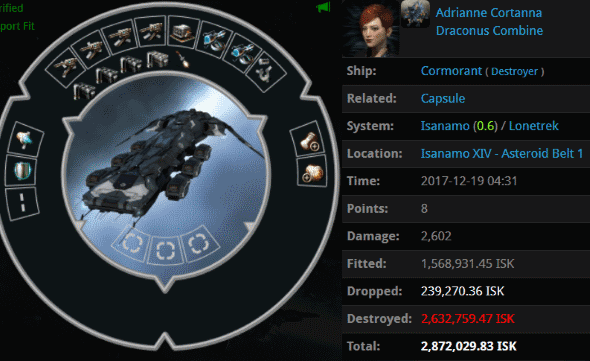 Adrianne's Cormorant was "puke tanked": Its only hope of survival was to make a would-be attacker vomit after scanning the fit. You know, it's one thing to be a bot-aspirant, but it's another thing to flaunt it. Agent Layalina had her work cut out for her. She was only a few days into New Order Logistics corp, but she already had a high-level Goofus on her hands. Time to sink or swim. Our Agents always win; the New Order attracts talent. Layalina deftly employed the use of the ultimate highsec litmus test. By speaking my name, she forced the miner to reveal the true depth of her depravity. Adrianne was certainly an odd duck. She complained about the size of Layalina's bounty, as if it somehow made the gank illegitimate. Now matter how much helpful advice she received, Adrianne always had a reason to complain about it and declare herself helpless. Don't be surprised to see her join Anti-Ganking one of these days. Nothing could derail our Agent's optimism. She gave Adrianne the hard sell. For the briefest of moments, it almost looked like Adrianne might be interesting in joining the New Order family. But out of nowhere, Adrianne had a change of heart, pulling the rug out from underneath our Agent by threatening to petition her. If Adrianne didn't want to purchase a permit, she should've at least hidden herself in shame. Instead, she began to enlist other locals to join her pity party. The Isanamo system needed another demonstration of the Code's power--and soon. 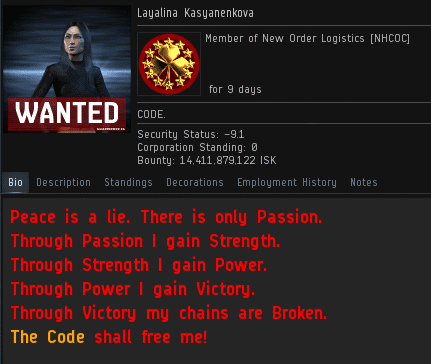 Layalina Kasyanenkova has proven my past comments that the CODE is roleplay.....that quote in the bio is the Sith Oath, and it goes like this. "Peace is a lie. There is only Passion. Pssst, we all knew that ehnieepoo. You sure are desperate for hits on your ebt blog. Alpha leech scum. You need a subscription to have an opinion here pleb. The Code always wins! Even when ghetto leeches try to wreck the game. The homepage of the EVE website shows a video of miners being shot at - if that's not a strong indicator of what will happen to them if they join, then I fear there is no hope for them and that we will just have to go on killing them. It's no different to seeing a trailer for Unreal Tournament, joining your first online game, and then threatening to petition Epic Games because another player blew you to pieces.